2016 has been a busy year for bespoke wardrobes and bedroom furniture for Waterhall Joinery, with a clear requirement for wardrobes that can be designed to maximise available space, particularly in rooms where space and restricted layouts are key. On one of our recent projects where we installed 2 slim line alcove wardrobes for one of our clients (see previous post), our client asked us to return to create bespoke wardrobes for her daughter’s room. The room being a small room, the brief was for maximum storage without being too imposing into the room. Being an older build house, the quirkiness of each room lends to the character and encourages you to be creative in your designs. 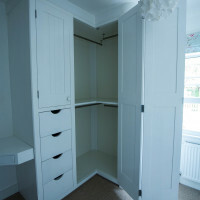 It was agreed to continue with the same style as the previous wardrobes we’d made, Maple spray finished white. As we were going to create a compact corner wardrobe with 3 doors, we decided to add a curved end panel to soften the design, thereby breaking up the block style of the wardrobe. As a surprise element for the daughter in the design, we incorporated storage within the curved end section so no space was wasted, which was also hinged to open separately. 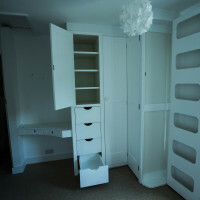 This bespoke design gave the furniture a unique feel to the daughter’s room. 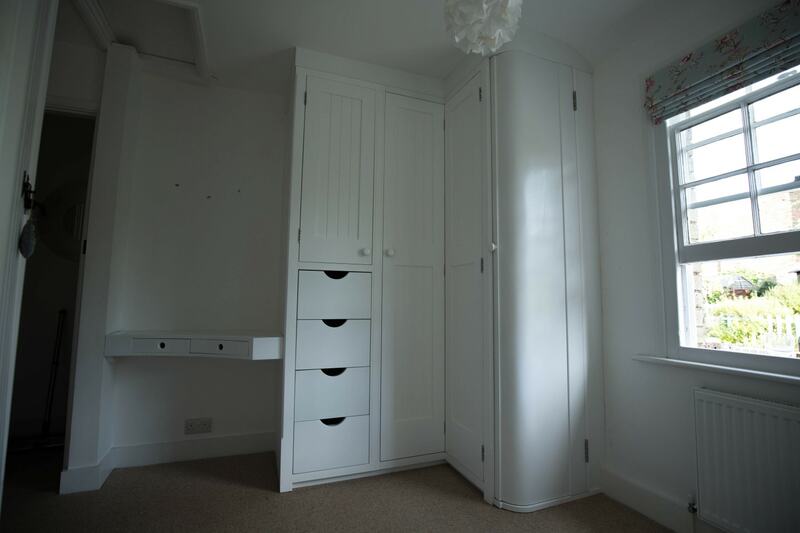 To enable the daughter to also have a vanity table in her room, a curved table was designed to come from the wall edge to meet with the wardrobe, and by curving the furniture the table did not jut out, but filled the maximum space within the gap beautifully. The drawers with their curved edging went the full depth of the unit, thereby providing ample storage for a unit of this size. The impact of the complete wardrobe, with the various components created to maximise the space, was quite stunning. As joiners, we felt we had certainly maximised on the brief, and the reaction from the client confirmed our thoughts. If you are considering bespoke wardrobes for your home, contact Waterhall Joinery to discuss your requirements further, we’d be delighted to help.